Microsoft has been thinking about motion controls, cameras and sign language, but says just thinking about them is as far as it's gotten. A patent filed by Microsoft suggested that Kinect might be able to recognize American Sign Language, among other forms of gestural text input. But today Microsoft has confirmed that the patent only represents an idea, and won't be a feature of Kinect when it launches later this year. In a statement, Microsoft said that it had filed the patent in order to protect its intellectual property, and that it shouldn't be taken as a guarantee of an upcoming feature. "We are excited about the potential of Kinect and its potential to impact gaming and entertainment," the statement read. "Microsoft files lots of patent applications to protect our intellectual property, not all of which are brought to market right away. Kinect that is shipping this holiday will not support sign language." But anonymous sources said to be close to Kinect's development process told Kotaku that it's not that Kinect doesn't recognize ASL, it's that it can't. The sources say that the resolution in the cameras was reduced to 320 x 240 in order to cut costs, which is too low to be able to detect something as small as a finger. This is impossible to verify however, and would also mean that pretty much every product listing for Kinect - including the one on Microsoft's own store - is wrong. As Microsoft said in its statement, not every patent necessarily represents a commercial product. 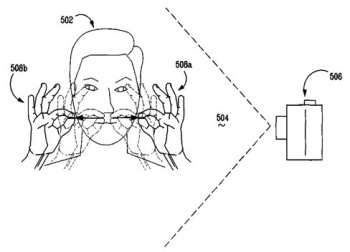 What seems most likely is that Microsoft is staking its claim to the sign language idea before someone else does. It's certainly possible that it's a feature that was cut, but as the first anyone seems to have heard of it was this week, it's equally possible that it was never planned to be ready for Kinect's launch.